Rub in the ghee and make medium soft dough with water. Keep aside covered with a damp cloth. Grind ginger and the garlic. Steam the fish with turmeric and a little water. Take off the flesh from the bones and mash coarsely. Heat up mustard oil in a kadhai, mix in the ground paste and red chilli powder. Mix in sugar, salt and fish. Fry, stirring till the mixture becomes dry. Mix in the panch phoron and mix well. Put 1heaped tblsp of stuffing in the center of each puri. 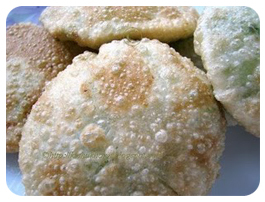 Gather the sides, make a ball once again and roll into a puri once again. Heat up enough oil in a karhai and deep-fry the puris one at a time.